Mercedes Drag Battle – E63 vs C63 ! - Muscle Cars Zone! 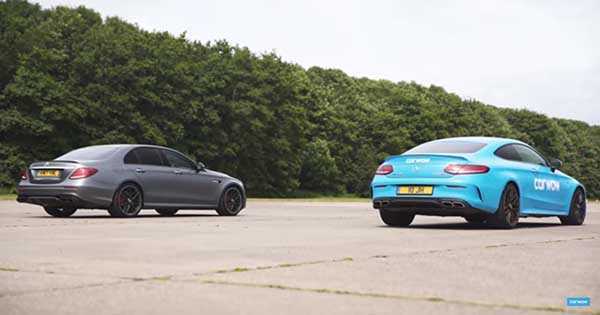 Mercedes Drag Battle – E63 vs C63 ! Right from the title you can see that a magnificent powerful drag race comes into question where to staggering machines will measure their strength! The E63 vs C63 discussion is very common to car lovers, so let`s see what each Mercedes has to offer! So, let`s start from the facts. Both cars have a V8 4 liter engine in them, but of course, they come with different power. As for the differences, that are also facts, we have the E63 with AWD and the C63 2WD! So, you interested in what will happen? As for the start, the Mercedes E63 S went a lot faster as it gained significant advantage in front of the Mercedes C63 ! It also finished the race way ahead of the poor C63. But let`s get into details and see the numbers, shall we? As for the E63 vs C63 1/4 mile race, the facts are as follows. In order for the Mercedes E63 to cover the quarter mile, 11.2 seconds were enough which makes this vehicle completely “nuts”! If we compare this to the Mercedes C63 and its 12.1 seconds, that`s more than enough. Now, as for your pocket if you wish to own one of these knights, things are like this. The E63 will cost you around $115,000, including a Twin Turbo V8 as already mentioned. This will bring you 610 HP and a speed of 60 mph in 3.2 seconds! The C63 on the other hand, costs around $100K sharp, but comes with 510 HP and needs 4.1 seconds to reach the 60 mph! Now, check out the race! Finally, follow this link to view the Mercedes AMG E63 review by Top Gear!